Bladder CancerBladder cancer is a urological disease that usually affects the cells lining the inside of the bladder. Because its symptoms are easy to identify, the disease is usually diagnosed in its earliest stages. Fortunately, bladder cancer is highly treatable; with five-year survival rates estimated at 98 percent for a stage 0 diagnosis and 88 percent for a stage I diagnosis. Bladder cancer is most common among older adults, with an average age at diagnosis of 73.
that there are more than a half million bladder cancer survivors in the U.S. alone? The disease is most prevalent in male adults, though females are susceptible as well. The American Cancer Society estimates more than 72,000 new cases of bladder cancer to be diagnosed in 2013 – approximately 75 percent of which will develop in men. The most obvious symptom of bladder cancer is discoloration or blood in the urine. Many bladder cancer patients have urine that is especially dark in color, varying in shades from red to yellow, and even dark brown. However, not all patients experience visible urinary changes. Instead, symptoms may be more vague, causing back pain, pelvic pain, more frequent urination, or pain during urination. See your urologist if you are experiencing any of these symptoms. How will my urologist diagnose bladder cancer? There are several tests capable of diagnosing bladder cancer, and your urologist may use any combination of them. They may include evaluation of a urine sample to detect cancer cells, as well as a CT scan with dye to examine the structures within your urinary tract. Your urologist is also likely to perform a cystoscopy, which involves the insertion of a narrow tube and camera through the urethra and into the bladder for visual examination. Cell samples can be collected from the bladder wall during this procedure. Cystoscopies are performed under local anesthetic for patient comfort. What types of treatments are available for bladder cancer patients? 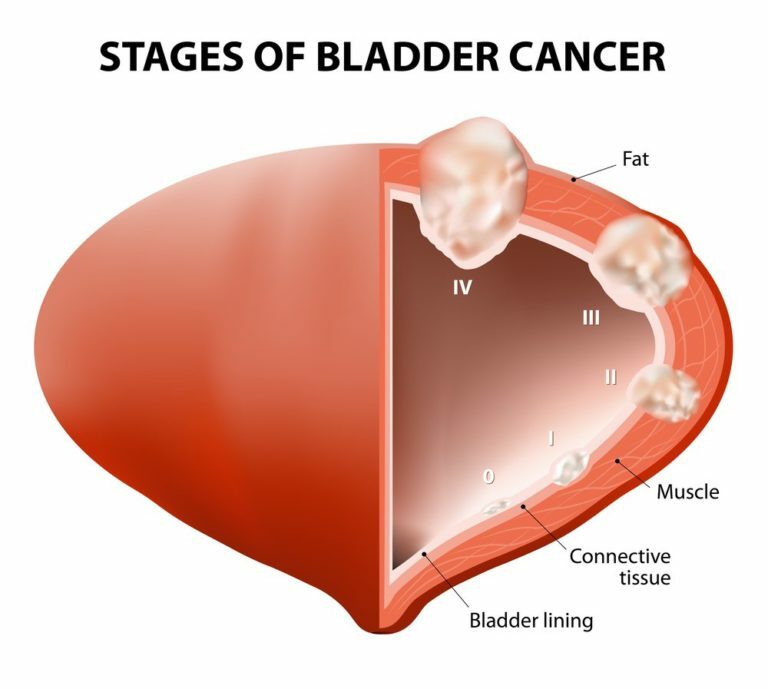 If you are diagnosed with bladder cancer, your urologist will form a treatment plan based on the stage of your cancer. The primary mode of treatment for bladder cancer usually involves surgery to remove cancerous tumors and sometimes part of the bladder surrounding it. More advanced stages of cancer may require surgery to remove the entire bladder, nearby lymph nodes, and perhaps some of the other surrounding non-vital organs. Your doctor may also recommend treating bladder cancer with other therapies, such as radiation, chemotherapy, or immunotherapy.